Click here to read the rest of this post about Easy Wood Slat Swedish Style ShelvingHi everyone! Here we are, a few months later, and the kids still LOVE it!!! In fact, the kids still love it so much, that they've moved all of their toys downstairs into the room too! Part of me was celebrating no longer having toys scattered around the living room (and let's just be honest, the kitchen, under the dining table, down the hall - everywhere upstairs), and the other part of me cringed when I went downstairs .... and the chaos was just piled up everywhere. So we made these bulk bins out of 1x12 boards for the baby's toys - and that picked up quite a bit of the mess. It also is a fast and easy way to put away all the small toys that our baby loves to play with. I'm fantasizing about the day when he puts his own toys away. So now what to do with big sister's stuff? Grace loves arts and crafts, second only to hanging upside down on monkey bars, and recieved so many craft kits and supplies for her birthday and Christmas, I was wading through them. I had wanted to make pretty shelving and perhaps paint it cute colors, but the mess was driving me crazy. I needed shelving now, I needed it fast, and it had to be deeper than a 1x12 board width. And my master closet is one of my favorite things ... ever. Although it certainly doesn't look this sparse and staged in real life now with both the hubs and my clothes crammed into it. 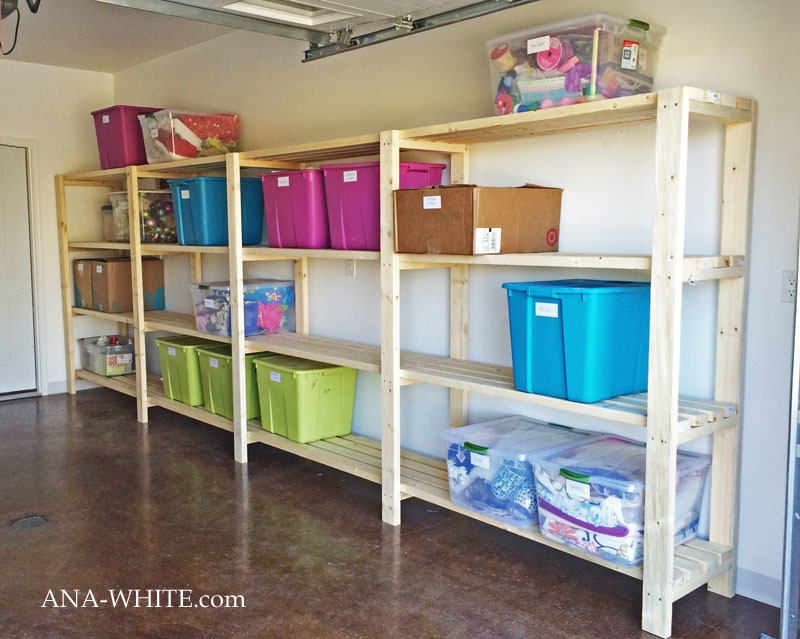 Both of these projects were ridiculously simple, fast and economical to make, so I thought, why not make playroom shelving? So I made this shelving the full length of the playroom. Because the shelves are all wood 1x boards, I didn't have to deal with plywood, but got a nice deep shelf (much deeper than a 1x12 width). The shelves also allow stuff to "breathe". I just wish I'd had the time and weather (it's still winter in Alaska) to stain or paint this project - maybe next summer. Thanks so much for reading and using my plans. If I haven't told you lately, I appreciate your support and am humbled to be able to create plans for you. 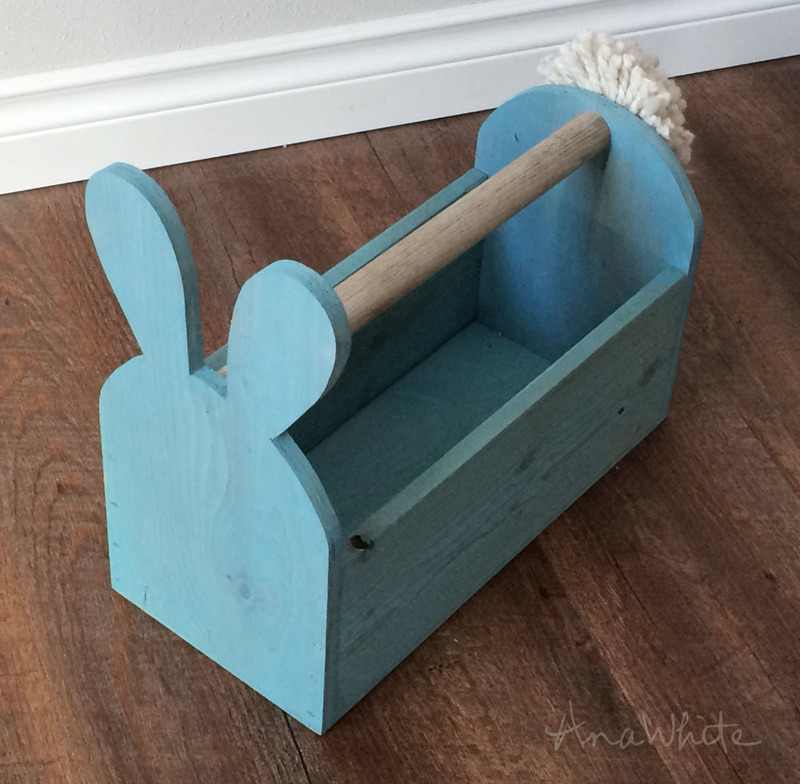 Click here to read the rest of this post about Wood Easter Basket Bunny Shaped TrugMy goodness you all have inspired me! I cannot believe the projects you are making with scrap wood! There's just a few days left to share your projects and get entered to win over $1000 in building funds, so if you have a scrap wood project, make sure you share it and include #GetBuilding2015 and #ScrapWorkLove in your post. This year, for Easter, I didn't want to buy my kiddos Easter baskets, especially since I still have a little scrap wood to use up. And it's always way more fun to make something. 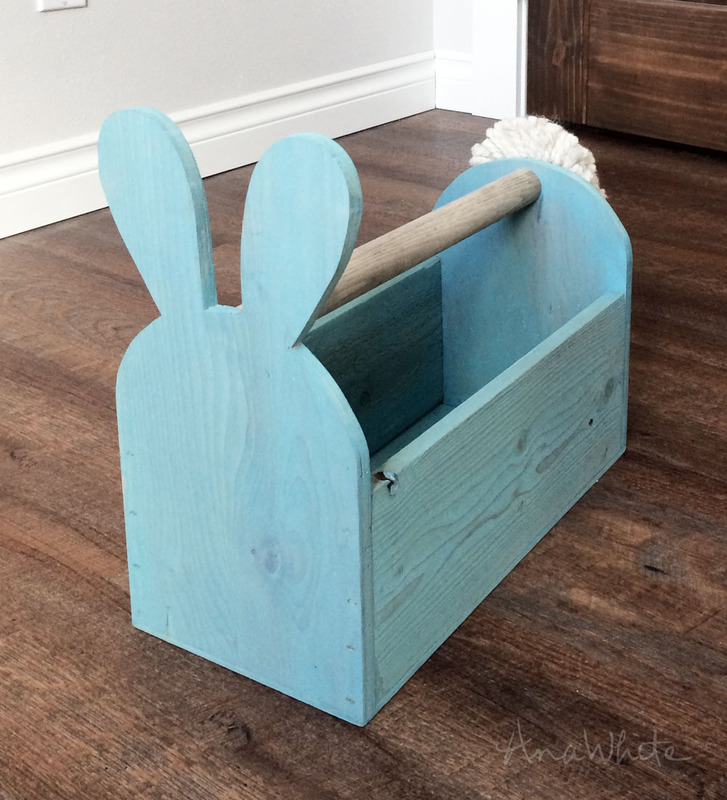 So I thought, why not take the age old wood trug caddy design ... and add bunny ears? I'm still pretty shocked at how cute it turned out! So cute, I borrowed my daughter's pom-pom making supplies and made a fluffy little tail. The baby instantly loved it and started filling it up with toys. And although this version is a little big, at one, he can carry it around. I might have to make him a smaller version more his size before Easter. This one is for big sister. I still can't get over that this beautiful one-of-a-kind wood Easter basket was just scrap wood and an old broken shovel handle a few hours earlier! I did not buy ANY supplies for this project - the ends are made of 1/2" thick plywood scraps. I used the 1/2" plywood because it's lighter weight than 3/4", but still strong enough for those bunny ears to not just bust right off (like 1/4" might). The sides are cedar fence picket pieces - I used them because its what I had on hand, but a 1x6 or plywood scrap would do. The bottom is then just 1/4" plywood scraps. And the handle is a broken shovel handle. I started this project by taking the 1/2" plywood pieces, and cutting in a rectangle to the size of the bunny face. Then I used a paint can to trace the round head and free hand drew the ears - they are not the same. If you would like to use a perfect pattern I made one for you here. Now the fun part - jigsawing it out! I got a little off on my lines, but since my lines are freehand anyway, what's the difference between free jigsawing, right? NOTE: I was okay with my cuts not being super smooth since I'm using scrap wood and mixed materials, but try a laminate blade for cutting with a jigsaw to prevent plywood from splintering off as you cut. Since I'm just stapling the whole project together (I used 1" staples), glue is essential. I was pretty generous with the glue. I used Elmer's Pro Bond Advanced - my kids can be pretty rough on their stuff, I need all the help I can get with a glue. And then just stapled the ends to the sides. Sorry for the blurry photo. It's not easy to take a selfie while nailing. Then more glue, more staples, to finish off the back side. Haha, back side. And then I added the bottom with lots more glue and 1" staples. Starting with the inside, I stained outward with a foam brush, wiping afterwards with a paper towel. This is why you use stain. Because you can still see the wood grain. Before I forget - the handle is an old shovel handle that was broken. I just cut it to fit and glued and stapled it in place. Now for the tail. I made up a pom pom out of yarn, and just used craft glue to attach it to the back of the project. You gotta have a fluffy tail on a bunny! Looks like I'll be making a smaller version too. If you love this, please share and pin! Have an awesome weekend! Bust out some bunny baskets! Click here to read the rest of this post about March Winners for #GetBuilding2015Thank you all for the amazing support and participation for our March #GetBuilding2015 contest! March's theme was #ScrapWorkLove in honor of Earth Day, and you all shocked the sawdust off me with your projects and entries!!!! I'm so excited today to annouce the winners of over $1000 in Home Depot gift cards! Our first random winner of $100 Gift Card to Home Depot is this amazing Scrap Wood Photo Book Holder! Built by this beautiful mommy, Amanda in Kansas! And our second random $100 Home Depot gift card winner is D. Aaron Guild! Thank you for posting so many amazing projects, but it was this American Girl doll chair that was randomly selected! 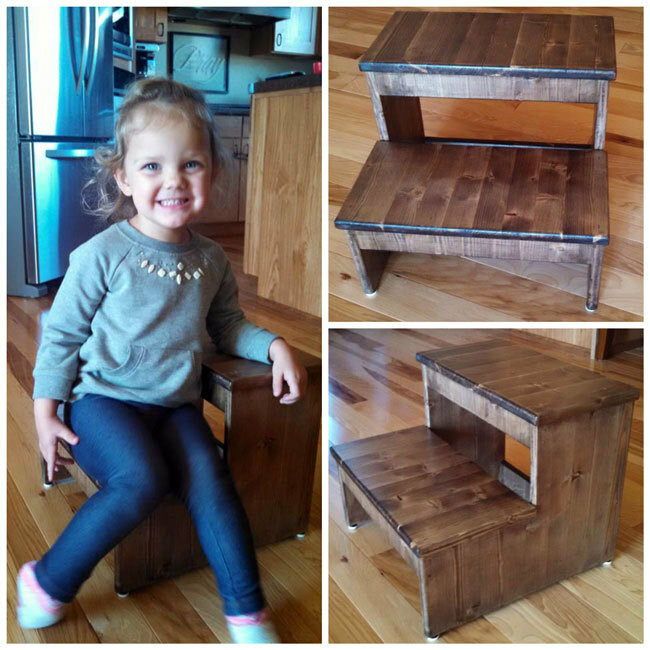 Our final random prize for a $100 Home Depot gift card goes to Becky F. for this scrap wood step stool shared on Facebook! I know this is hard, but try to look beyond that cutest smile ever and see the step stool. What a beautiful little project! Well, that was the easy part - letting Random.org pick random winners. Choosing the next two prizes, Most Creative and Most Beautiful was quite a bit more difficult. There were so many amazing entries! There were so many amazing entries, and every single one was creative. Some were creative in the use of materials. Others were creative in the design, and still others were creative in functionality. I can't even begin to touch on the awesomeness shared. But we had to pick one (don't envy me), so I decided to pick a project that did all three - creative in design, functionality and use of materials. To create this wall piece that doubles as shelves. I was amazed by the creativity, the use of even the tinest scraps, and the design and functionality. 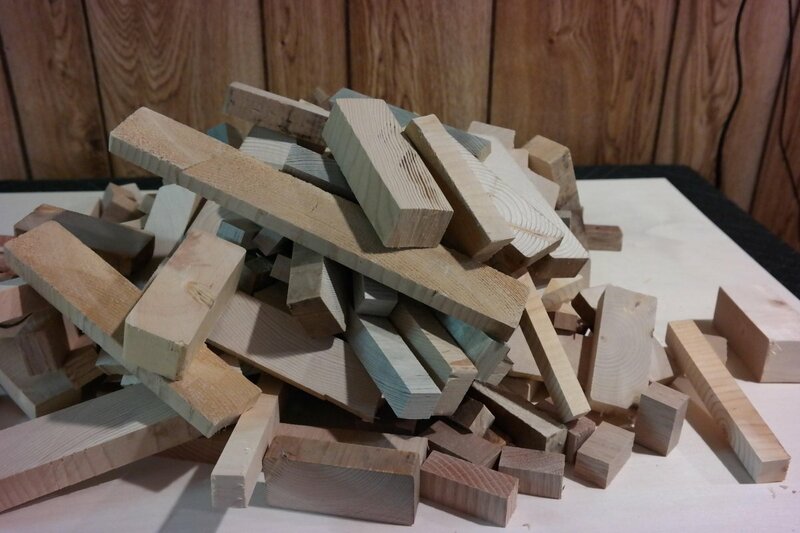 Congrats, Joe, you are the winner of a $300 Home Depot gift card for your beautiful scrap wood wall piece! Now this one was especially hard to pick. There were at least twenty that deserved to take home the most beautiful prize of $500 in Home Depot gift card building funds. 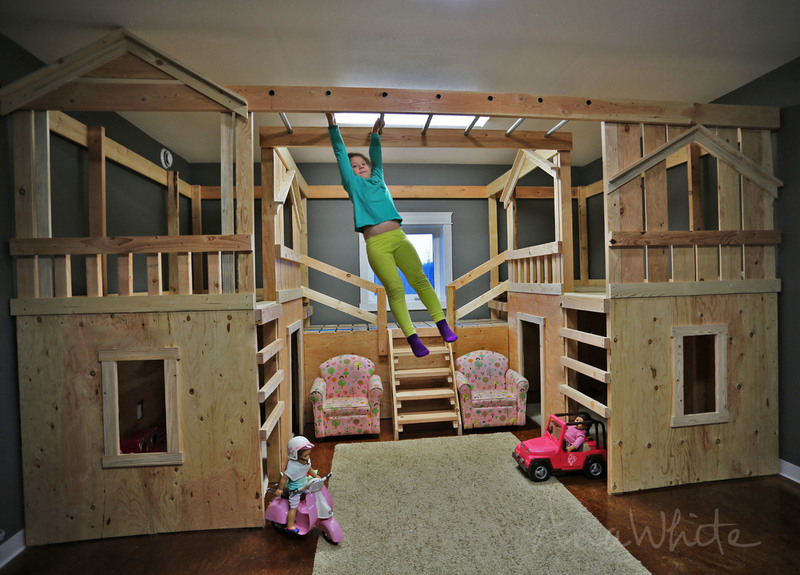 Like these amazing bunk beds that Mamasdance made for free out of scrap wood. How beautiful are they? and Alaska shaped wall art! There were so many amazing entries. I could not possibly post them all. 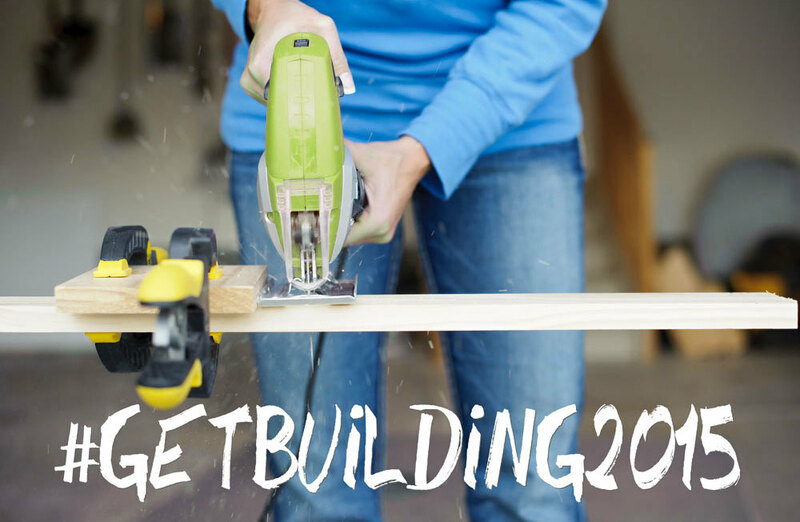 If you'd like to check all the entries out, just go to Twitter, Facebook or Instagram and search #GetBuilding2015 . Make sure you like and comment and share your favorites! And now, finally, the winner of Most Beautiful! Congrats PRosenbalm. 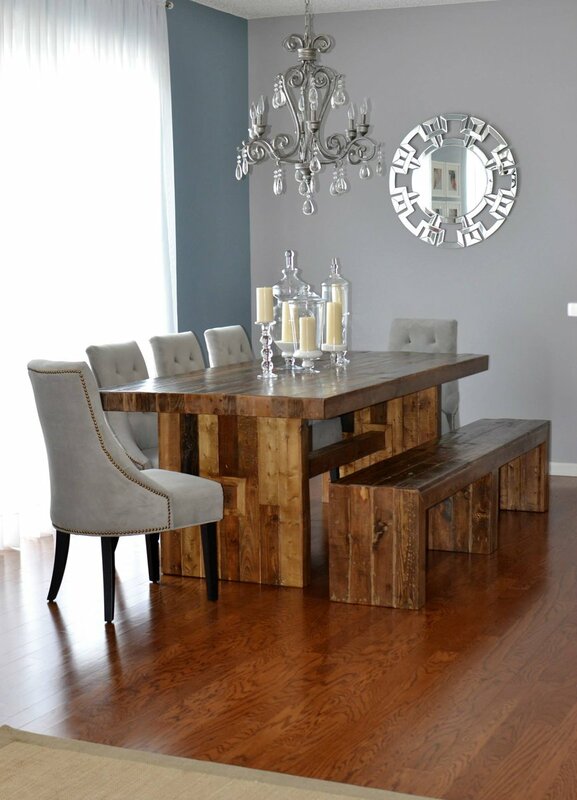 This dining room set is absolutely beautiful. And thank you for sharing so many of your scrap wood projects. I am so inspired by your work and use of materials. Thank you all for inspring an entire internet to see value and use in scrap wood, no matter how tiny or what shape the wood is in. I will be sharing on Friday the project challenge for April! NOTE: Winners will be contacted directly. Click here to read the rest of this post about April #GetBuilding2015 Build Challenge!Thank you all for your support and participation of our March #GetBuilding2015 build challenge! I know I for one will never look at a piece of scrap wood the same! You all rocked the internet in March!!! I'm pretty darn excited to announce the challenge for April because it involves my most favorite room in my home! I'll give you a hint - in this room, I couldn't tell you what color the walls are, there's not a throw pillow in sight, and definitely no pretty curtains. I'm talking about my garage of course!!!! I work in a garage since I'm up here in Alaska where winter hangs around for a good eight months out of the year, but I know people that work in their car ports, basements, and even spare bedrooms, the kitchen table, or set up in the back yard. It doesn't matter where you work, as long as your set up is perfect for you, you've got yourself a #BuildCave! For the month of April, I'm challenging you to show us where you build, work on a project that improves your workspace, and share it! And I've teamed up with the folks at the Home Depot and Kreg Tool to get you some awesome prizes!!! - In the month of April 2015, share photos relating to you building in your workshop, and add #GetBuilding2015 and #BuildCave to the text of your post on Facebook, Instagram or Twitter. Each week, on Sunday, I will challenge you to post a photo relating to this month's challenge. It's going to be super fun! Let's inspire the internet to #GetBuilding2015 and get people asking "What the heck is a #BuildCave?" PS - No idea what the Kreg Foreman is? Trust me, you want one. Really bad. Here's more info on it. Click here to read the rest of this post about April 2015 Home Depot Do-It-Herself Workshop: Paver PlanterThis post is sponsored by The Home Depot. See full disclosure below regarding DIH Workshop. * Happy Monday fellow builders and DIYers!!! I hope you had an amazing Easter weekend, filled with appreciation and reflection, family and friends, and maybe just a little bit of chocolate. The children loved the wood bunny baskets I made them. I'm so glad some of you used the plans too. I really enjoy seeing your photos so thanks for sharing your builds! And while it's obviously still not quite spring up here in Alaska, spring is definitely on it's way. The birds are chirping and snow is dripping from the eaves, promising that soon, Alaska will be in full bloom. There will be endless sunshine, flowing rivers and wide open fresh air. I just can't wait. Except for the mosquito part. This year, I am so excited to once again be a part of the Do-It-Herself Workshops with The Home Depot! I am so thankful to have an opportunity to share my projects on such a broad, hands-on scale, inspiring and encouraging women all over the country to learn to build and use tools. Every third Thursday of the month, at 6:30PM, the Home Depot puts on a FREE Do-It-Herself workshop, just for women DIYers! The workshops are all free, offer step-by-step instruction on a wide variety of home improvement topics. It's a great time to grab your girlfriends, learn a new skill, have fun, and pick up supplies for your next project. These amazing ladies will be hosting workshops with me at their local Home Depots! And, of course, all Home Depots across the country will be putting on the same workshop, so you can attend even if you don't live close to these stores. I will be hosting four workshops this year! The first workshop I'm hosting is on April 16th. Make sure you save the date and register right now to attend! 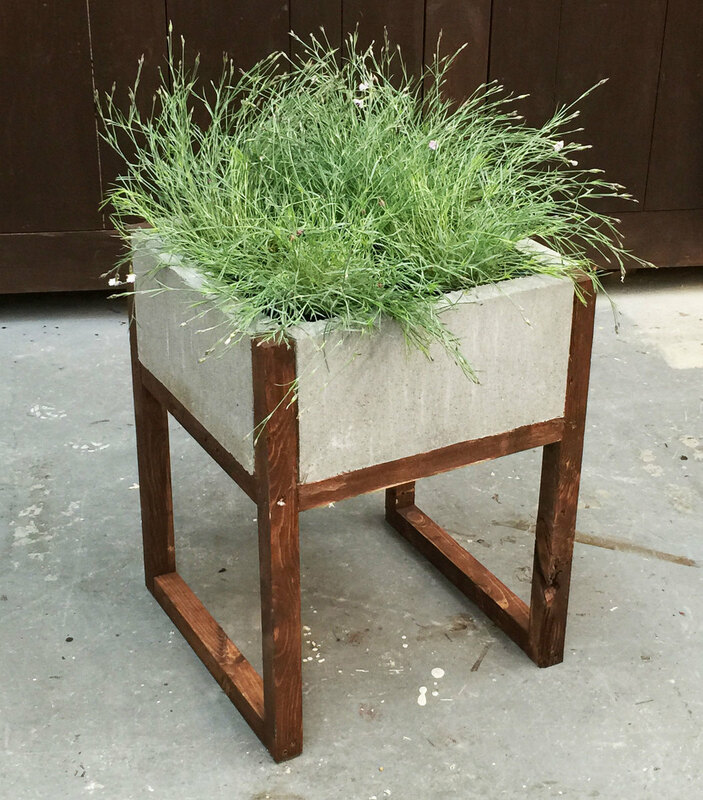 We will be making this beautiful concrete and wood planter! I love the mixed materials! 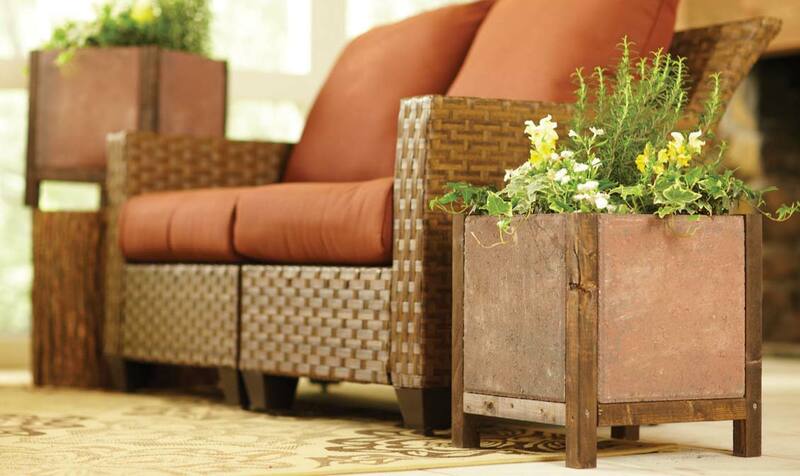 The April DIH Workshop will feature a demonstration on how to make this unique and beautiful paver planter out of simple materials with basic tools. 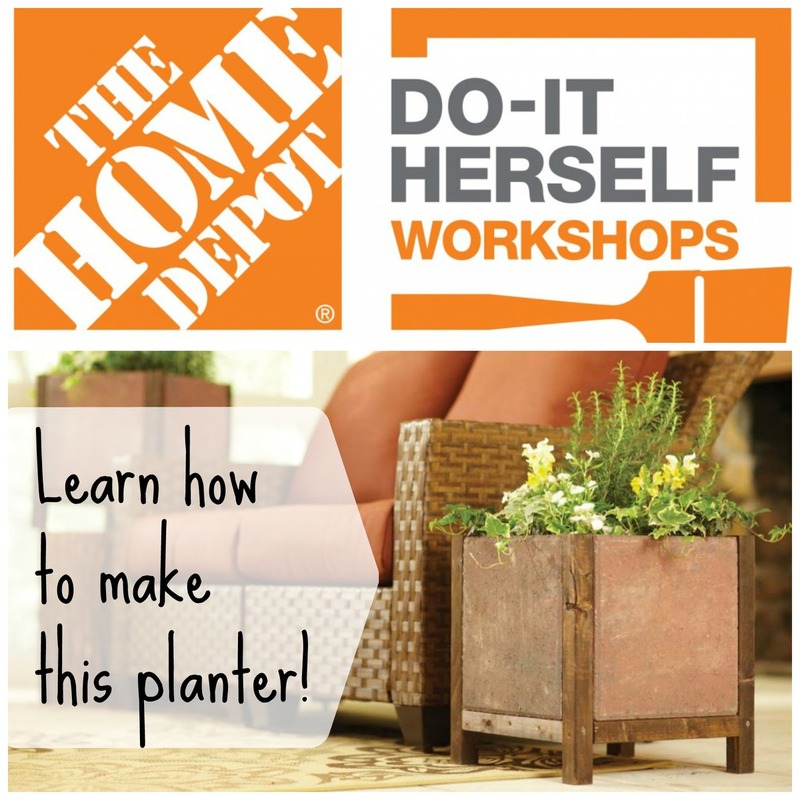 Please register now to attend your local DIH Workshop! And stay tuned - I'll be sharing next week my own custom version with project plans with you! Oh man, am I ever excited to share these new plans with you today!!! This spring, I wanted to create new potting bench plans for you that are still super simple to make, but this time, I wanted to integrate more storage on the hutch and back. 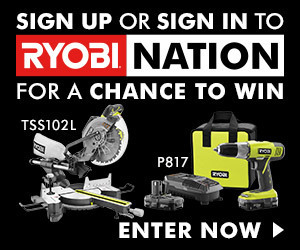 So I teamed up with my friends at Ryobi to create these plans for you!!! Even after making this potting bench, I still can't believe it used to be lumber! One of the things I love the most about this potting bench is the back is like a pegboard! 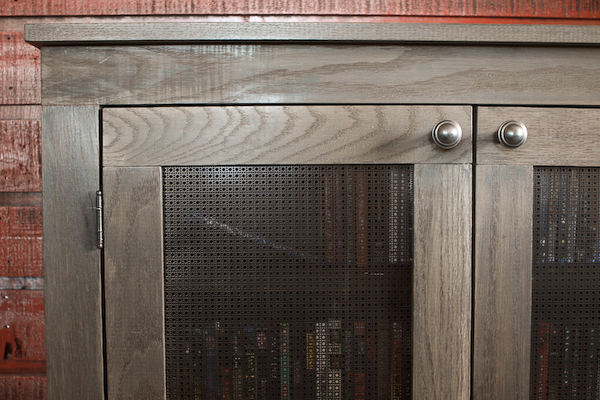 You can use any "over-the-cabinet" accessories to customize your hutch for your needs. 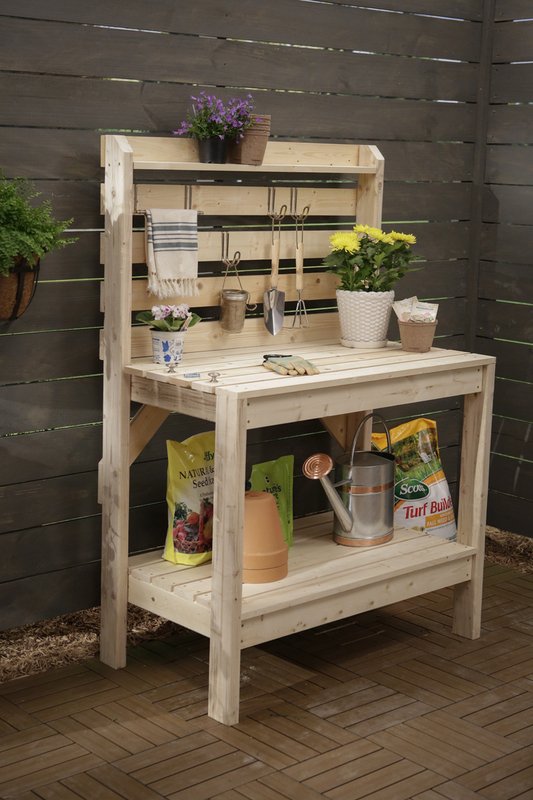 You'll also love how quick and easy it was to build this potting bench! You can get the step by step plans and diagrams over at Ryobi Nation, so head on over there now to check it out. And to celebrate this potting bench plan, I'm teaming up with Ryobi to get one lucky person a chance to win this ultimate building prize package! A miter saw and a drill kit! You can build amazing things with just a drill and a saw, so if you've been wanting to get into building or just need to upgrade your tools, here's your chance to win some of the very tools that I used to build this potting bench!!!! Just click the image above or here to enter! Good luck and hope you love the potting bench plans as much as I do! Click here to read the rest of this post about Our Next Project!You know those mountains that you can see from our little town, up here in Alaska? When I was growing up, our family referred to Mt. Hayes as "Angel Wing Mountain" because we thought it looked like an angel, looking over our little town. For twenty some years, we've dreamed of owning a little cabin, nestled somewhere within those mountains, on a lake full of jumping fish. Somewhere where we can go, and gather as a family, and remember why we love Alaska so much. A place where work can wait, where we can go to find inspiration and refreshment. In the summer months, we camp throughout Alaska, enjoying the endless sun and mild temperatures. But in the winter, that can last eight long months, it's too cold and dark to camp - especially with small children. Having a cabin helps break up the long winter months. Over the years, we've looked for a parcel of land on Paxson Lake, about a two hour drive from our home, just past the summit of this mountain range. 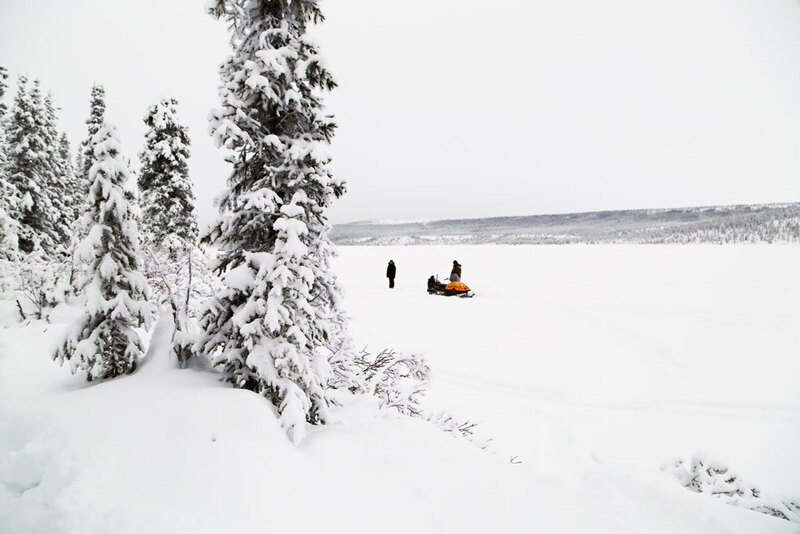 We especially love Paxson Lake for the fishing, the caribou migrations, the blueberries, the proximity to endless outdoor activities, and the quietness of it. Unlike many other lakes in Alaska with land available for cabin sites, Paxson was not subdivided around the entire lake, so the lake is quiet and sparsely populated. But this also means finding land to purchase is scarce and expensive. Just a couple of weeks before our son was born in 2013, my husband found a listing for a small parcel on Paxson Lake. And the parcel of land was something we could afford. We thought surely there is something wrong with this parcel. Being full term at this time, I couldn't risk driving two hours further into the Alaska wilderness, past medical help, should our baby decide to come early. So Jacob went alone to inspect the property. He came home with good and bad news. The good news is the property is not along the busy main road, where you can hear cars passing and truckers hauling freight. The property is about a mile off the road, and you actually have to snowmachine, boat, hike or ATV to the property). We loved that. And the property was completely natural and free of any structures to remove or work around. The bad news was the property was covered in about six feet of heavy mountain snow. There would be no way to tell if the soil was swampy (as it often is in this area) or buildable. We couldn't know until spring if the lake shore was gravel or mud either. Knowing the property would be sold before spring arrived, we took a gamble, and put in an offer, hoping for good soil and a solid shoreline. Nine days after our son Hayes was born, I saw our property on Paxson Lake for the first time. It was a winterwonderland of deep deep snow, a wide open lake, and winter quietness. We could hardly wait for spring. When spring finally arrived, we took our first trip down to Paxson. We were so thankful to find a shoreline of rocks, with a base of pea gravel. Grace even found herself a little beach. The land though, would present some challenges. Since this area is located in the mountains, where water drainage is constant, parts of the property are very damp. But considering land on other parts of the lake, we were very happy with the property itself, but knew there would be foundation challenges. That summer, with a new baby, we tried our best to work on a cabin on this property, but we were only able to put a foundation and floor in. I will share posts soon on the work we did get done last summer. Those babies sure do keep you busy, don't they? Especially when you are trying to work remote, off the grid, and working from a campsite. But I think our baby knew something we didn't. Had we been free to work without children to care for, this cabin would have been done last fall. And we would not have been able to be part of a new opportunity. We are so excited to share with you that not only are we going to be building our dream cabin on a lake in remote Alaska, but we will also be teaming up with the amazing folks at DIY Network to share the building process on television with you as the next special for the Building Off the Grid Series!!! Our little angel was watching out for us when he wasn't letting us get work done. We start filming on Monday!!! We start building on Monday!!! I don't know which I'm more excited for! I truly feel that everything happens for a reason, that there is a greater plan for me and my family. This time around, I feel so calm and ready. Our baby is sleeping through the night and eating and going several hours between nursings. Our other projects are wrapped up and in a good place. And the folks at DIY Network are happy to let me blog and share the process of building this cabin - so while filming, I won't have to be top secret and MIA for weeks on end. I'll be able to share detailed tutorials and behind the scene photos, and keep in touch with the blog through the whole process! I can't wait to share - I'll be posting posts on all the work we've done so far - from building a remote foundation, to framing up a floor, to designing the cabin itself (and if you follow me on instagram, you already know this, handcutting a timberframe for it), and will be sharing all the steps that follow. Check in sometime to see how we are coming along on the cabin. And I'll let you know as soon as I know when the special airs on DIY Network! Thank you so much for the support you've shown us through the years, the babies, the projects - we hope you are there for this next project too! PS - I didn't win the sawdust fight. Click here to read the rest of this post about Designing Our Remote Alaska Lake CabinThank you all for all the nice comments and likes last week! We couldn't be more excited to have this opportunity to build a dream cabin in Alaska, share the process with you through blogging, and if that wasn't enough, get to work with DIY Network to film it all! When our new baby was just nine days old, we took a quick trip down to look over the property that we had just purchased, and I had not yet seen. There was several feet of snow, so we could not find the corner posts of the property to determine the property lot lines. We'd brought along our Aunt to watch the baby in the car, but at just over a week old, I was in a hurry to get back to the baby. So our quick winter visit didn't give us much perspecitve on the property we had purchased. Despite not having a good feel for the land, as the winter months passed, we started talking about what our dream cabin would look like and how it would function. In Alaska, cabins are normally left cold, and then heated up when used by a wood stove. That means when you arrive at your cabin, it could be extremely cold, and it could take several hours for the cabin to heat up to room temperature, depending on the size of the cabin. So building small is generally favorable. But we didn't want to go too small, where the space becomes uncomfortable and overcrowded when guests join us. My original idea was to build two small cabins, each with their own wood stove, and connect them with a breezeway. The breezeway would also be the entryway where coats and boots could be stored. The main cabin would be sized just for our family with a kitchen and small living room. The second cabin would be a bunkhouse where guests could stay. With the two cabin design, if it was just our family of four, we could just warm up the main cabin. If guests join us, we could then put a fire in the woodstove of the second cabin, and have it toasty and ready for them. It was the breezeway that I wanted more than anything. I dreamed about driving up to the back of the cabin, and opening the front door into this breezeway, and the lake is right there in front of me. Wouldn't that be glorious? When spring finally arrived, I could hardly wait to start laying out the cabins. We hiked in last May, and took a look at the property. We are thankful for every square inch that we own of this property, but the lot itself is very small. And with the lot sloping downward to the lake, with a sizeable hill on the back side of the property, I knew my two cabin design was just not going to work. We just didn't have the space to spread out multiple cabins, and connect them with a generous breezeway. And with the downward slope, there would be no space behind the cabin to make the breezeway rear entrance possible. I was so sad to shelf that idea, maybe for a new cabin, maybe you could use it for your cabin. But for us, on this lot, on this lake, we would need to come up with a new design with a more compact footprint. This time around, after looking over the land, we made a new list of all the things we would want in a cabin. The new floor plan would be much simpler, a 32 foot long by 24 foot deep square. The decks on either side would be eight feet. I then started modeling the cabin in Sketch Up. How could we make this simple foundation better? I've always loved timberframe structures. Although we both have never built a timberframe home, or even had much experience with or around one, we started talking about possibly creating a roof out of timbers. I started drawing timbers into my design. We both immediately knew this was the route we wanted to go. The timberframe just added so much beauty, charm and wood to the design. Having no experience with timberframe joinery, we started working with a timberframe design company to take our design, and help us create a structurally sound and beautiful timberframe roof plan. And this is the final design. Isn't it hard to believe that this cabin is just four walls with a beautiful roof? Although we did have to make some compromise, like nix the two-cabin-breezeway design altogether, we are so happy with the design of this cabin. What do you think of it? We start building and filming today, so follow me on Instagram for live updates, and of course, I'll be blogging the whole process, so hope you can check in sometime and see how things are coming along. This post is sponsored by The Home Depot. See full disclosure below regarding DIH Workshop. * Let me just warn you now ... after this post, you may never look at a concrete paver block the same again. This is the week! And tomorrow is the the day!!! If you haven't already got yourself registered to attend tomorrow night's DIH Workshop at your local Home Depot, make sure you do that now!!! Because who wouldn't want to know how to build a planter out of concrete pavers! 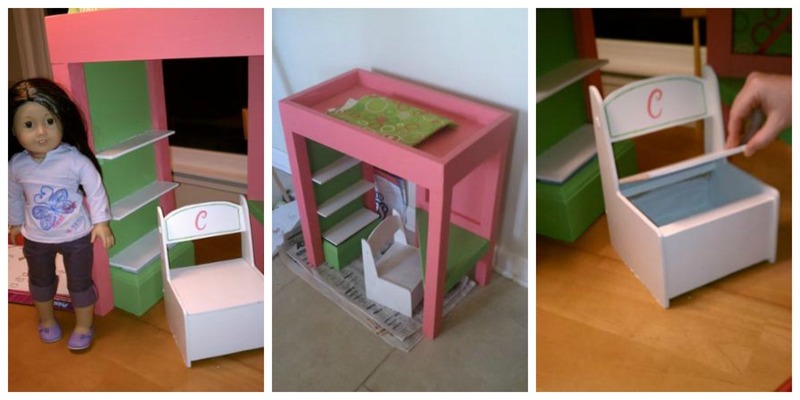 Of course, you can customize this plan and make something absolutely perfect for your own home or space too. These planter are all so beautiful and creative, I'm almost afraid to share mine! Since it's still winter in Alaska, I couldn't get the 12x12 paver blocks used for landscaping yet in my Home Depot. There was still several feet of snow in the outdoor section. So I headed over to the concrete section and found 16x8x2 concrete block caps, and decided to use them instead. And here's what I came up with! The rectangle concrete pieces just seemed to fit a more modern shape, and I love the results! It's also suprisingly sturdy (that landscape adhesive is the real deal) and very heavy - great if you live in a windy area. - Measure your blocks first, and build the openings about 1/4" bigger to allow for the landscape adhesive and for the blocks to slide in place. The plans for my modified modern version of the Paver Planter follow, but don't forget - tomorrow night at 6:30 PM all Home Depot's across the country will be doing a Paver Planter Do-It-Herself Workshop, so register now, grab your girlfriends, and have fun building!!! 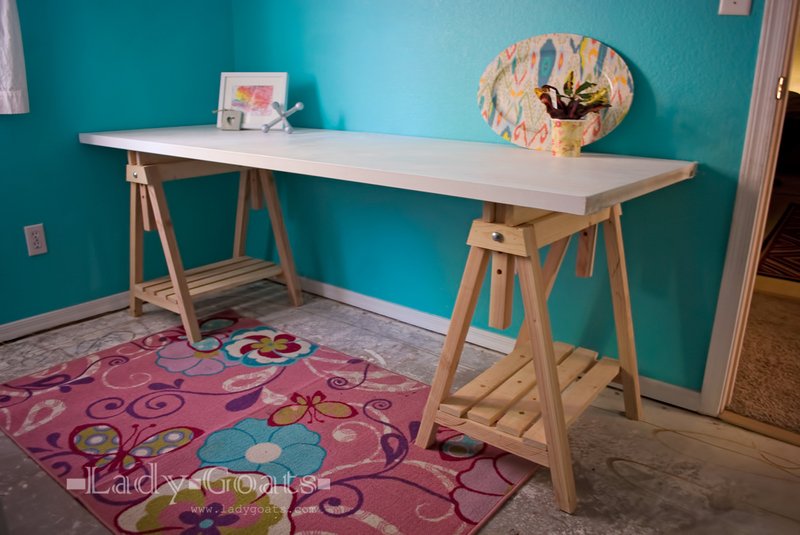 If you build, please share and add #DIHWorkshop to your post so we can find it. Can't wait to see your paver planters! Have fun tomorrow night! PS - Modern style planter plans follow (if this is the homepage, you'll need to click "Read More" below). 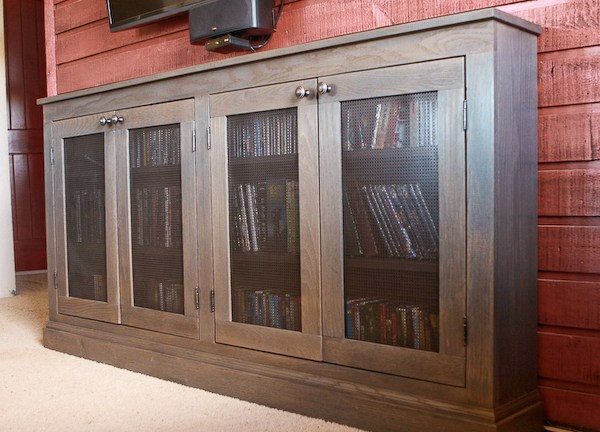 Click here to read the rest of this post about Primitive Pie Cabinet Entertainment CenterHi everyone!!! When I first started building furniture, I made alot of the "primitive style" furnishings. As a beginner, I found primitive style furnishings easier to make for probably the same reasons that the early Americans did - simple, form follows function, using wood boards in easy widths. I also loved the simple lines and easy style of primitive furnishings - it works will every decor, and takes paint and specialy finishes well. So I was pretty excited when my friend Hillary from The Friendly Home asked me to team up with her to put together a primitive style media cabinet for her friend. 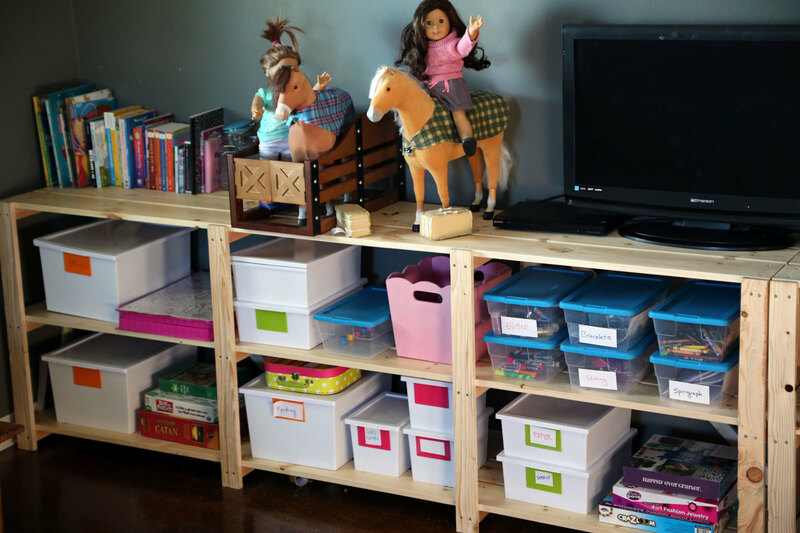 Hillary used oak boards, and narrowed up the depth to fit DVDs and the space. Hillary's favorite part of the cabinet is the finish. I kinda love it too! I'm sharing the plans below, but make sure you take a second to check out Hillary's building post here - she's got all the details on the finish, the mods, the hardware - you won't want to miss it! 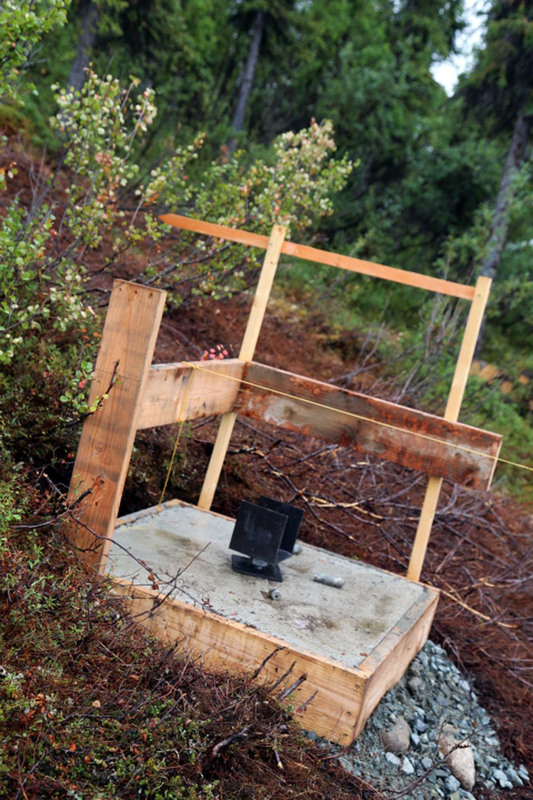 Click here to read the rest of this post about Building a Remote Cabin Foundation on Mucky SoilHi guys, Jacob here. If I write a post, it's gotta start with a cool picture of Alaska. We spotted these big bulls on the drive to the cabin site. They are going to be some nice bulls by hunting season. So about that cabin. It's sure coming along! We did get a ton done last week! Make sure you follow Ana on Instagram - she's been sharing live progress photos. But none of this would have been possible without already having a foundation in. I put a foundation in last summer. All the winter before putting the foundation in, I was doing research and trying to figure out the best way to put a foundation in remote Alaska. I have built cabins before, but not with soil conditions like Paxson Lake. Let's not forget three things - we have a baby, the build site is off the road system, and no heavy equipment can be used. That and I'm still young - 36 at the time - let's just say digging a foundation with a shovel is a little bit tougher than it was ten years ago. So I've been research all different sorts of ways to put in a remote foundation. We'll get to that in a minute. Since we bought the property in the winter, we only had clues as to what the soil might be. By looking at the trees, I knew the soil wouldn't be great - small, black spruce is an indication of mucky soil. I had also talked to other cabin owners in the area, and they had all confirmed my suspicion that I would be working with less than ideal soil for the foundation. But I needed to dig a test hole just to see exactly what I had on this piece of property. The first day I just removed the top soil. I found alot of very large boulder rocks with a clay layer around them. The ground is still going to be frozen underneath the vegetation layer, so I wanted to see what happens when the ground thaws. The ground was frozen about a foot deep, so we left the hole and decided to come back the next day and see what the hole looked like when the sun heated it up. The next day, I returned to the hole I dug, and it was solid muck. Not the best news I've ever had. The more I stomped around, the deeper the muck got. Then I pounded a rebar stake into the hole, hitting lots of rocks and lots of muck. And more bad news - I couldn't find a bottom to the muck. At this point, I was still optimistic about the soil. The water could have been just because the soil around the hole is still frozen, so the water had no where to drain. I had done quite a bit of research over the winter about Helical Piles or Pier posts. The are sometimes called "screw piles" too. They are basically giant screws that are drilled inot the ground and your foundation sits on top. Everything I had read about the Helical Piles is that they are perfect for mucky areas, and can even be installed under water. The screws lock into the soil, well below the frost layer, so your foundation won't heave and jack when the ground freezes and thaws. It seemed like the perfect solution for our remote build site with it's less than ideal soil. There's only a few companies that do these foundations in all of Alaska. I started calling, and it just happens that one of the companies was doing a foundation nearby. So I asked them to come to my site and do a test drill. The machine is really small and lightweight and with some manuevering, was able to get to the cabin location. But when they went to drill, the machine had a hard time getting around the giant bolders under the moss. It was very hard for machine to drill, as he tried to snake the screws past the giant boulder rocks while keeping the screws pile plumb. He just kept drilling and drilling, dodging boulders, and couldn't find a bottom. They thought perhaps using a bigger screw pile could work, but were concerened because they were hitting big boulders, that when finished, the piles would not line up or be accurate. Bigger screws would provide more flotation in the mucky soil, but would be harder to accurate drill in with the large boulders. And it would also get alot more expensive. The screw piles were a great idea, an awesome techonology - but with the combination of my mucky soil and big boulders, they just weren't going to work on this piece of property. So it was back to the drawing board for me. - You have to have a floating foundation that just sits on top of the soil. Using the advice of the other cabin owners, I thought, why not design into the foundation a system where I can plan on the foundation sinking and heaving with freezing and thawing, but instead of shimming the foundation constantly, have a system that I can adjust the height of the foundation. I can't beat the extreme Alaska climate, but I can be prepared for it. - I'll pour concrete pads every 6-8 feet. These pads will provide flotation on the mucky soil. The size of the pads are determined by the size needed for a footer for the size foundation I'm creating. - Then I'll drill a hole in the middle of the concrete pads, and thread a big all-thread through the center. - Ill add a large nut and washer plate to the middle of the all-thread on top of the concrete pad. - Then to the top of the all-thread, I'll weld on a bracket that holds the upright posts. - As the foundation sinks, I can turn the nut, which moves the all-thread up or down, adjusting the foundation as needed. The first step is to layout the foundation on the ground. I used rebar stakes and string line. Since I'm on a sloping lot, I had to use a transit to make sure I was accurately placing the stakes in a level plane. Our cabin itself is going to be 30 feet wide x 24 feet deep. Of each side will be 8 foot decks. I decided to do the foundation for the decks at the same time. Then its time to dig. Those boulders the screw piles didn't want to get around weren't any more fun for me to dig up. I didn't have to dig deep though - just enough to remove the vegetation layer and create a level pad for the forms. And then assembled the forms at the site. This worked pretty well, especially since I have 18 forms to put in. 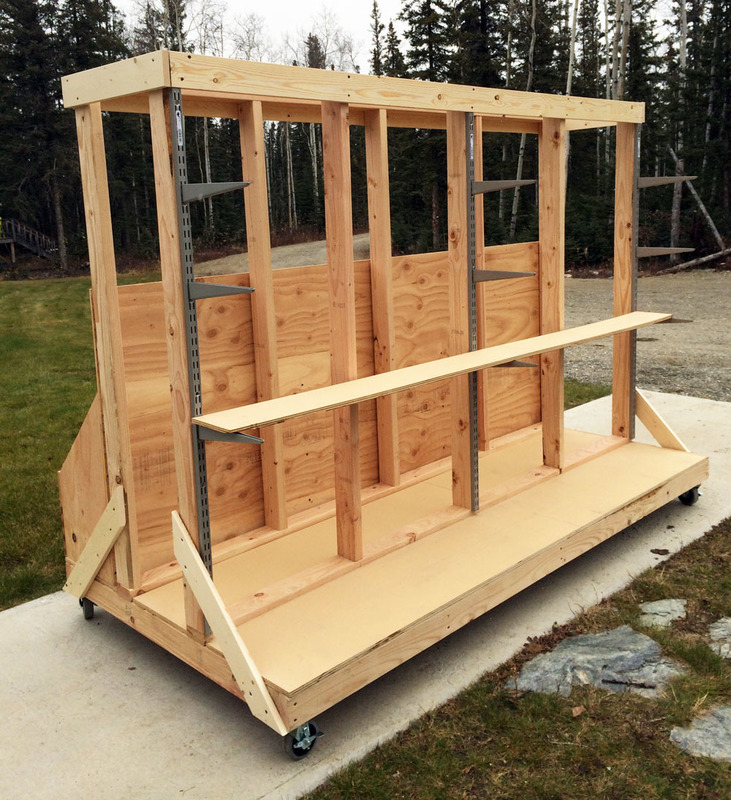 I built this ATV trailer so it would hold six five gallon buckets. Then I hauled in gravel, by the five gallon bucket on the trailer. And then just pour the gravel right from the trailer into the holes I'd dug. After leveling out the gravel I placed the form on top, and then pounded concrete stakes on all four sides of the form. Then I just used a level to level up the form, nailing into the stakes to keep the forms level. I had precut rebar back home, so all I had to do on site was place the rebar in the form, elevate on rebar chairs and tie in place. We are finally ready for concrete. So about that concrete. I had thought about buying a mixer and mixing concrete on site, but after doing some figuring, I realized two things - either way, I'd have to haul the concrete on site, and also haul more gravel to mix with the concrete. So we called the nearest concrete plant - about 75 miles away - and got a quote for delivering concrete to the road. It was alot more reasonable than we had thought, so we decided to go that route. My cousin helped dump the concrete buckets into the forms, and Ana helped screed the concrete. It was a very intense couple of hours. But this is what will hold up our entire cabin, so well worth the extra effort to bring in the concrete. Once the concrete cured, I started laying out where to drill the holes for the all-thread brackets to fit. And used a plumb bob to find the middle hole locations to drill. I rented a concrete core drill for drilling the holes for the all-thread. Grace's job was to make sure every concrete pad had a square washer and the metal bolt with nut on it. That look says "Dad, I was playing in the lake!" Here's a corner all done. And one of the middle ones. For there, I'll go up with upright posts - but we'll get to that in the next post. So what do you think? Is this going to work? PS - Ana's been sharing our current cabin progress photos over on Instagram. Click here to read the rest of this post about Adjustable Height SawhorsesHi there! There is a couple of reason I haven't. One, at $35 a sawhorse - sure we can do alot better than that - but it's not like you are saving hundreds or thousands to DIY your own. That, and this project presented some design challenges - I try really hard to create plans that don't require specialty tools, and although I know many of you do have tablesaws that bevel (myself included), many of you don't. But when my friend Gina from Lady Goats told me she wanted to make four sawhorses, I knew we could save about $100 on four - that, and it's way more fun to build your own, right? Only a few angle cuts this way. Lady Goats nailed this project - well, she actually screwed and bolted it together. Check out Lady Goat's building post here - she's got a really clever way of drilling those adjustment holes! And lots more photos. See you back here for plans (click read more below if this is the home page). Click here to read the rest of this post about Vintage Style Three Legged StoolHappy Friday! I'm so honored today to get to share a project built by one of my building besties, Jaime from That's My Letter. If you don't know Jaime, well you really should! Check out the amazing That's My Letter Build page! How crazy amazing are these projects? Jaime is a creative genius, always amazing me at what she comes up with and the level of quality and attention to detail. Here work is true inspiration, built to last and be loved. 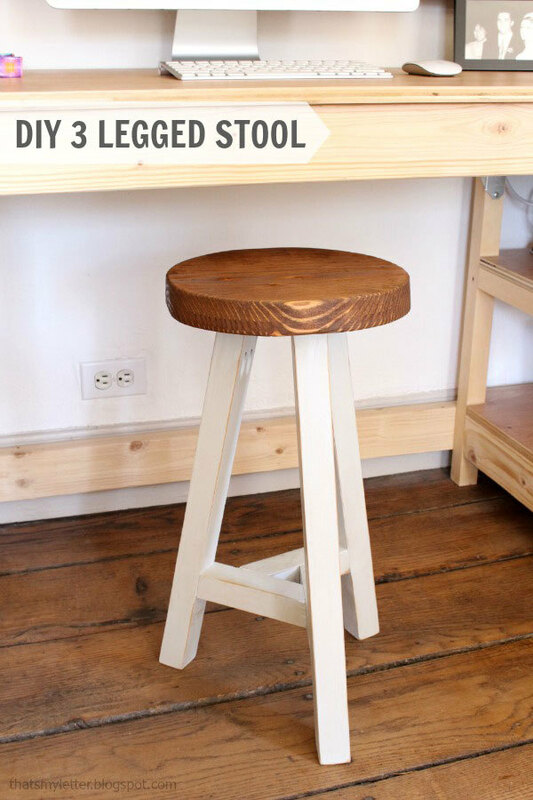 I love the "found" look of this little three legged stool made from 2x2s and scraps. When Jaime asked me to draw up plans for you, I felt like the luckiest lady in the world! Of course I said yes, and the plans follow. But you'll want to go check out the desk behind this stool and the inspiration for this stool, so take a minute and click over to Jaime's build post right now. See you back here for plans! We've just got a few days left in this month's #GetBuilding2015 Challenge - to spruce up your #BuildCave! And let's not forget that someone is going home with a Kreg Foreman Pocket Hole Machine!!! Could be you! I've been working on making my own BuildCave a little more organized and nicer over the last year. One of the more recent projects I took on was new sawhorses! Of course we have lots of sawhorses, but we needed extreme heavy duty ones that could support huge timbers that we are prepping for the cabin. So I came up with this design. So this is the other side of the shop where all the work gets done ..... those sawhorses really stood up to the job, even when huge beams were placed on top and chiseled into, they stood solid! We loved these sawhorses so much that I actually made no less than six of them! I think they are the perfect design for the workshop with a wide top, cross bracing horizontally to prevent side to side movement, and splayed legs for back and forth stability. I love them. 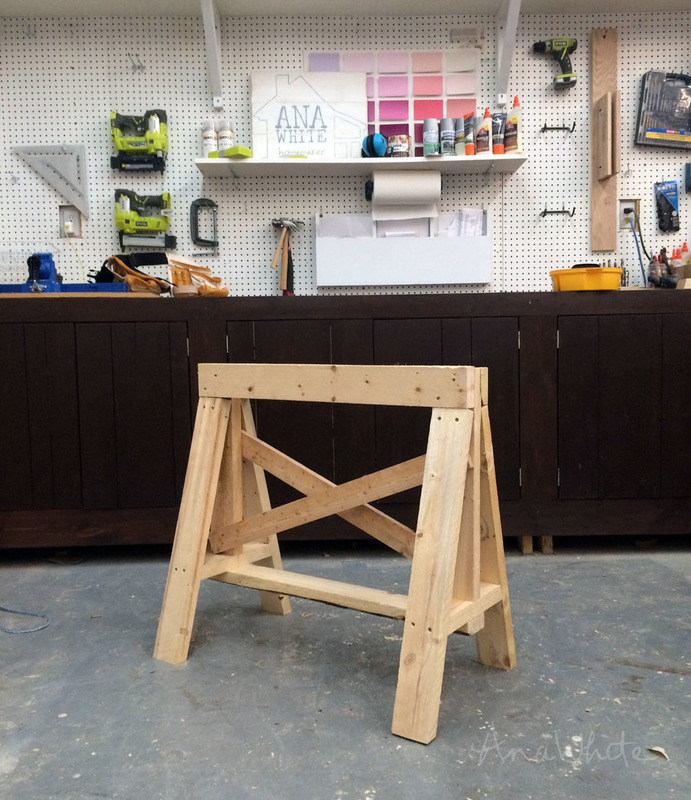 I put together a quick little video on how this sawhorse was made too, check it out! We've been planning on building a dedicated wood shop for years. An awesome Build Cave just for creating projects out of wood. But something always seems to come up first. I'll admit a little bit of that has to do with me still not set on how my dream wood shop will be set up. Think designing a dream house could be hard? Designing a dream wood shop is even harder, because that's where I'm going to be spending my time! And it's probably going to be bigger than my house. Knowing that we plan to start on a wood shop in the near future, I've put off work on my current work space - a large two car detached garage that hasn't seen a car parked in it in years. But finally, last fall, I decided I needed to make some minor improvements to my existing workspace. I need a clean, organized space to work, where everything is just right, and just where I left it. I'm also one of those people that can't function in a messy space, so I needed everything put away just so so I can concentrate on the task at hand. It drove me crazy, having open shelving with sawdust all over the essential building stuff that I can't live without, but don't want to look at constantly. But I didn't want to be wastful and rip perfectly good shelving out. How about that? Because I used scrap 3/4" plywood for the doors, this whole project costs me about $30!!! After tackling my workbench, I had one other pretty big BuildCave problem. 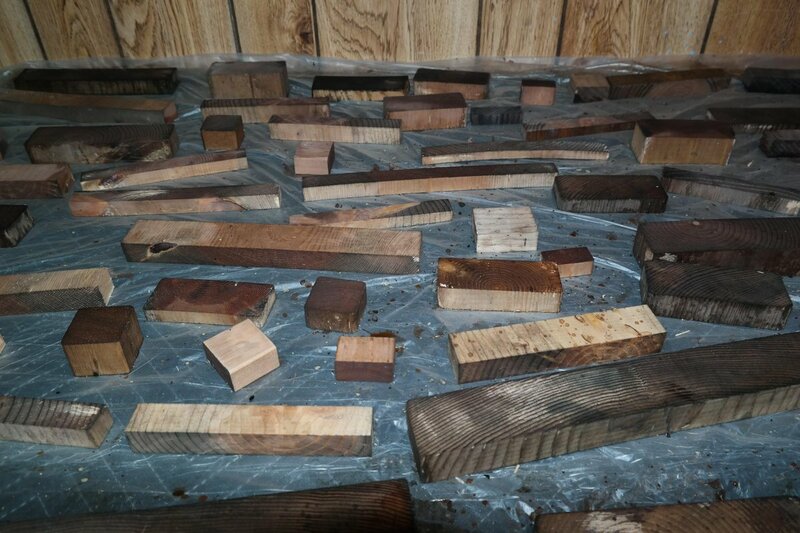 My scrap wood. 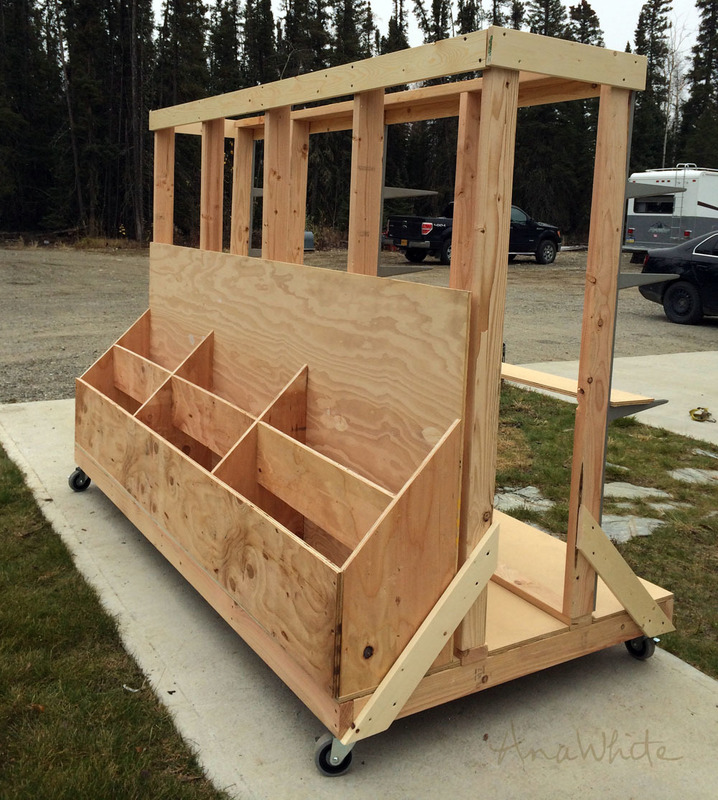 I designed this wood cart, so I have a spot for plywood in the center, bins for different lengths of scrap wood on one side, and then shelving on the other side for longer lengths of wood. This is how it turned out. Those scrap wood bins are life savers. But I'll be completely honest with you - These rail shelf hardware systems are pretty spendy, and once you load the wood on the shelves, it's not like you are adjusting them. I wish I'd just made shelves. - When full of plywood, this cart becomes extremely heavy, so it's very difficult to move around. I'd consider making the plywood area smaller. Check the plans out below and let me know how this lumber cart works out for you if you build it. So that's my Build Cave! 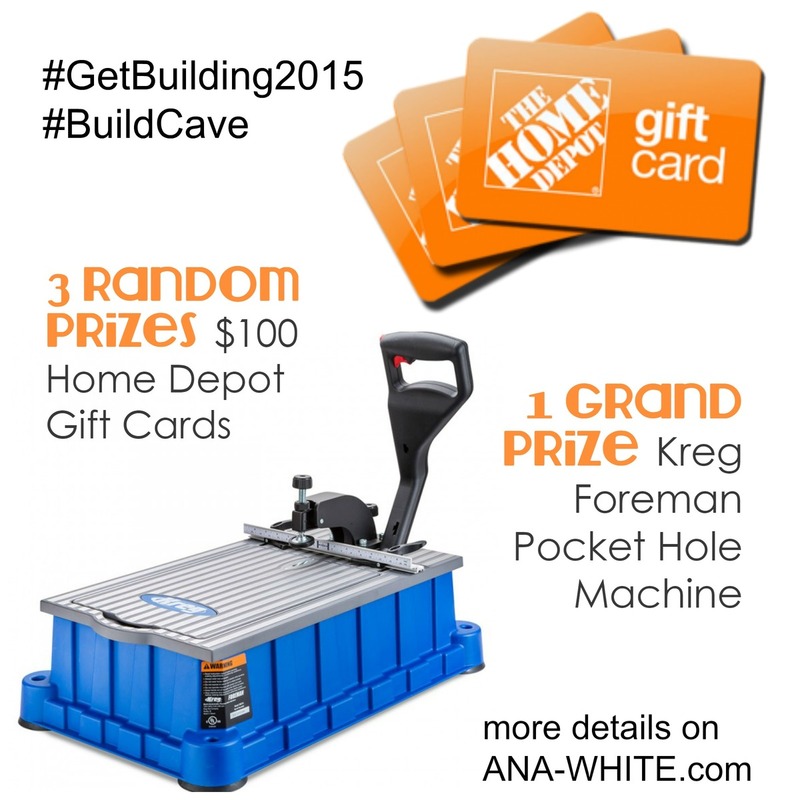 Don't forget to share yours - there's just a couple days left in this month's #GetBuilding2015 Challenge - someone is going to win a Kreg Foreman Pocket Hole Machine!